Could you be in a feature? At Featureworld I am always searching for new stories to put up to editors of national newspapers, women’s magazines and TV. * Post-holiday stories – love rats from holiday, holiday romance stories, nightmare holiday stories from this year’s holiday. * Christmas stories – yes it might only be September but incredibly I sold a story for Christmas to a magazine at the beginning of August – and many mags are already sorting out their seasonal pages. * Weight loss stories with great photos and an inspirational story behind them. 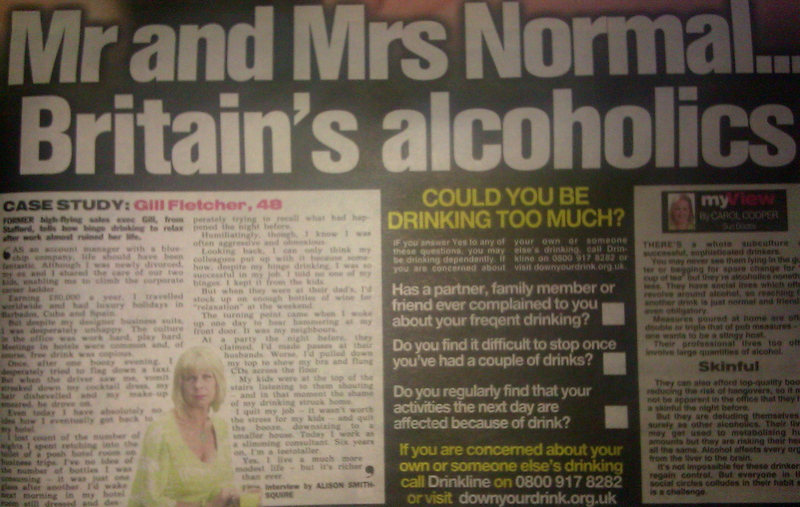 Interviewee Gill Fletcher appeared in THE SUN newspaper as a case study yesterday contributing to a much larger story on ‘the new alcoholics’. Every day I receive requests from editors and researchers on national newspapers, magazines and TV shows asking for a case study. This is someone whose real-life story is usually run as part of a bigger feature or alongside a news story – and readers and viewers like them as they give the very human aspect to a story. I have sold Gill’s story before – and so when a request came in just after lunch from The Sun newspaper on Friday, I immediately thought of her. I sent Gill a text asking if she would be happy for me to send her story to The Sun. She was – and later, at 5pm that day, a photographer popped to her home to do a photo. As with all interviewees whose stories are placed as case studies, there is always a Featureworld payment for their time. And if you want to be a case study, I don’t need to have sold your story before – many people come via my Featureworld Casting Directory. There, you can sign up to free alerts from editors and TV researchers, applying to the case study requests that interest you for free. Meanwhile, just as interviewees such as Gill can be sure of a personal service, so can editors and TV producers. I am not signed to any case study link service but offer a finding case study service to put publications and TV researchers in contact with prospective interviewees. For more details click here: Case Study Finding Service. Requests for newspapers, magazines and TV, are sent out to interviewees signed up on the Featureworld Casting Directory. Meanwhile TV researcher’s requests are also show-cased on their own very popular page: Casting Opportunities.